I always like putting a little chopped mint on my fruit salads. I love the little extra flavor that it gives the fruit. Recently, I hosted a baby shower and made a fruit salad. The mint in the garden is just starting to sprout so I sadly had to buy some. For me, mint is the hardest thing to buy because for six months out of the year, I can't seem to get rid of it! After my salad, I still had plenty left in the container. After about 10 minutes of complaining that I just spent money on mint, I remembered my sister's chimichurri sauce. Any annoyance that I was carrying around was quickly whisked away as I rushed for the fridge to see what other herbs I had. I wanted to call her for the ingredients, but she was on her tropical honeymoon ... didn't think she'd want me to call her for this, but I couldn't wait. I would have to figure it out on my own. I remembered that she used mint, parsley, cilantro, garlic and a little crushed red pepper and I went from there. I did use a little veggie broth instead of straight oil which many recipes use. Feel free to play around with the ratio that works for you. It was strictly personal preference not to do a 100% oil sauce. This was such a fun recipe to make. I was full by the time I got done making it. I couldn't stop myself from taste testing for salt and spices! Put all ingredients in your food processor or high speed blender and mix until it is a nice sauce with no chunks. I have been putting this on EVERYTHING! 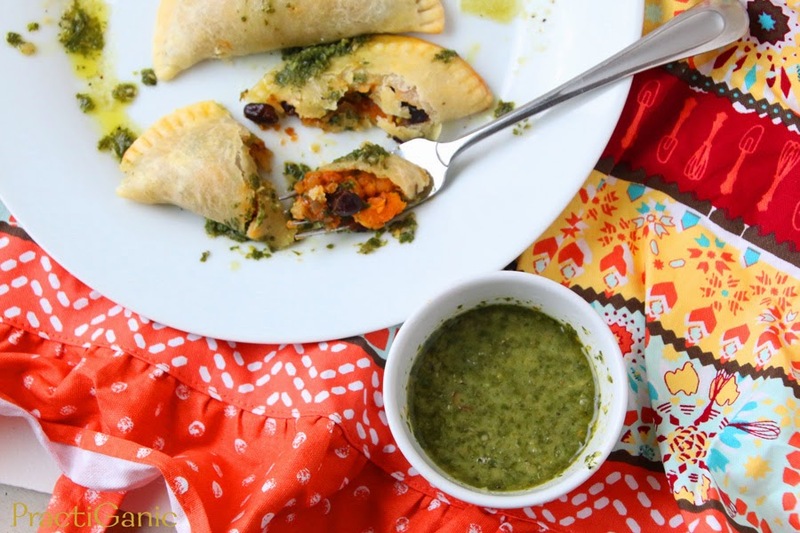 Below is it pictured with some black bean and sweet potato empanadas but the house favorite has been putting it over Walnut Meatballs! I've used it as dressings on my salads and dipping my vegetables in. 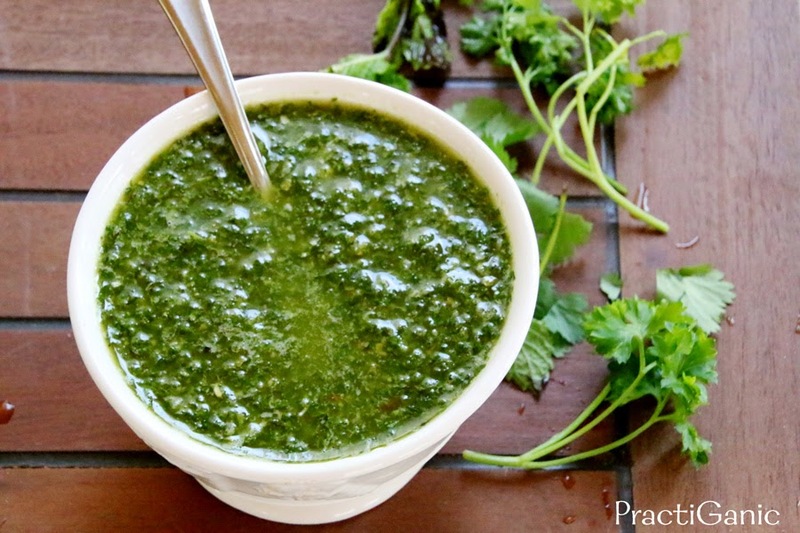 This chimichurri sauce is so versatile you can seriously use it for anything. 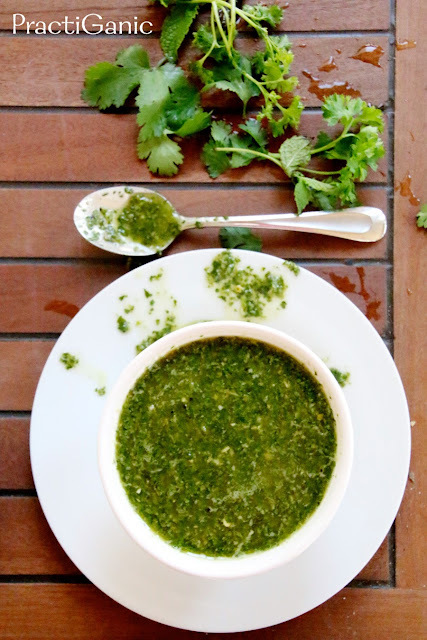 I am so excited for my herbs to start growing because I'm pretty sure you will find this sauce in my refrigerator all summer long!